Exeter bounced back from last weekend's loss to Northampton to beat struggling Gloucester in the Premiership. The Chiefs led 19-0 at the break through two Thomas Waldrom tries and another from Olly Woodburn, while Gareth Steenson kicked two conversions. Greig Laidlaw got Gloucester on the board with a penalty before Charlie Sharples went over in the corner for a try, which Billy Burns converted. 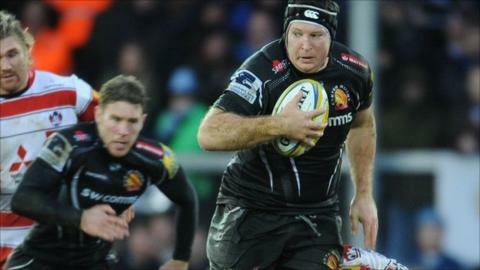 Exeter pushed for the bonus point but despite late pressure could not cross. The hosts lost wing Jack Nowell to a knee injury midway through the second half and that could have implications for England's Six Nations squad, which is announced next week. The club's backs coach Ali Hepher said Nowell had suffered a "twisted knee" and he would be "assessed in the week", but added: "Sometimes the least painful ones can be the longest out." With the wind in their favour, Exeter scored twice inside the opening 10 minutes as Waldrom crossed after Julian Salvi charged down James Hook's kick and then went over off the back of a driving maul. Woodburn scored in the corner from Steenson's chip over the Gloucester defence, but to their credit the Cherry and Whites staged a mini-fightback. Laidlaw sent over a penalty shortly after the break and Sharples touched down with 12 minutes left. Exeter had a late effort ruled out by the TV official as they failed to score the fourth try that would have secured the extra point. "At the start of the day we would have taken four points. To not concede a losing bonus point is obviously important. "It was one of those days when you just have to battle through it and not having the ball was the best option. We showed good enthusiasm and intent to battle away and got our tries off our defensive work. "We played pretty well with the conditions and all in all we are really pleased. This sets us up nicely for the two-week break in the Premiership." "The conditions were horrific for both teams. We conceded three tries - three in the first 20 minutes, two in the first 10 minutes - all three from our errors. "All three I don't think Exeter had to play through any phases of play at all, so once you give a team as good as Exeter in these conditions that much of a lead it's a long way back - but I actually thought we played some good rugby. "There's no secret as to why they are at the top of the table - they've been building this, they're a very, very hard team to play agains and they do their jobs very, very well." Exeter: Dollman; Woodburn, Nowell, Whitten, Short; Steenson; Chudley; Hepburn, Yeandle (capt), Francis, Atkins, Parling, Armand, Salvi, Waldrom. Replacements: Taione, Moon, Low, Hill, Horstmann, Lewis, Hooley, Campagnaro. Gloucester: Cook; Sharples, Meakes, Twelvetrees, Purdy; Hook, Laidlaw (capt); Wood, Hibbard, Thomas, Savage, Thrush, Kalamafoni, Kvesic, Morgan. Replacements: Lindsay, Murphy, McAllister, Galarza, Moriarty, Heinz, Burns, Atkinson.